I love Chinese New Year and I remember with mounting excitement how much fun it was when I lived in Hong Kong. I also remember being given the little red packets of money (hongbao - 红包) by our Amah and all of the local tradesmen and women - there may have been only a few HK dollars in there, but I treasured the attractive packets and kept them on my “treasures box”……in fact, I still have a few packets from the 1970’s! Unlike our New Year, the Chinese celebrate their New Year over fifteen days, which makes for a fortnight of festivities and fun! They take time off work, visit relatives, go to the races and of course watch all of the dragon and lion dancers in the teeming streets. I remember the food was amazing, and we would enjoy little crispy dumplings, wonton, grilled corn on the cob and spring rolls as we wandered amongst the crowds on Hong Kong Island and Kowloon. One of the recipes that my mum brought back from Hong Kong to the UK is for the “Lucky Lettuce Wraps” – these were always served at Chinese New Year as lettuce holds a very significant place in the canon of special occasion ingredients - the word in Cantonese is very similar to the word for “rising fortune” and so lettuce assumes a status of being a lucky vegetable. The other auspicious ingredients are tangerines and oranges, once again, the names for these fruits are very similar to the words for luck and wealth respectively. 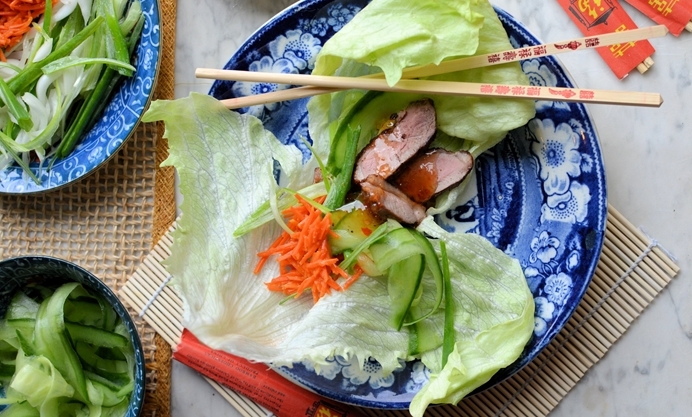 But back to my Lucky Lettuce Wraps – mum used to make hers with chicken or fish, but as I love Peking duck, I decided to create a new version using crispy skinned duck. 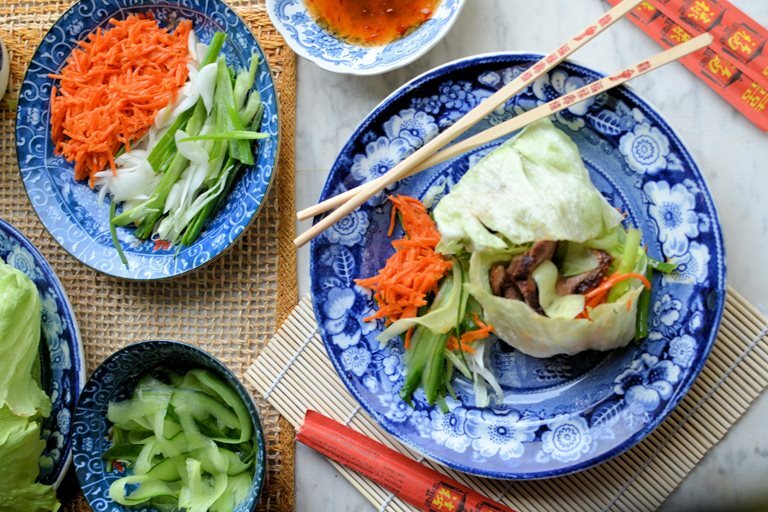 My lettuce wraps or parcels as I like to call them are very easy to prepare and they make a great communal “sharing” meal, as all of the components can be placed in the middle of the table for individual “wrapping”. You CAN use Peking duck style cooked duck, but we love the tender slightly pinker version using duck breasts and then slicing it thinly for wrapping enjoyment. I hope you will enjoy my recipe for Lucky Lettuce Wraps (Crispy Duck Parcels) this Chinese New Year, and if you prefer to serve these with plum sauce, as is traditional with duck, that’s fine, it’s just that we love the tang of chilli and garlic sauce with these.